Zerorez SoCal Technicians: The Best in the Biz! Zerorez SoCal technicians are the best in the business. New technicians work under the careful guidance and instruction of a senior technician for two months or more before they are certified to work independently. Zerorez SoCal technicians must also pass an 18 page comprehensive exam that covers carpet and upholstery styles and types, fibers and fabrics, chemicals, stone and tile, equipment usage and maintenance, and a host of other topics. Most technicians have been with Zerorez for two or more years, and only the best are allowed to stay. Zerorez technicians are expected to arrive at your house or facility on time, dressed cleanly and neatly, and are able to communicate clearly and completely about what they will be doing, and to discuss with you any concerns you might have about the process. They can also make recommendations or suggestions about a host of cleaning issues at your request. Zerorez technicians will place corner guards at critical points to protect your paint and wood base boards. They will place plastic shields or foam blocks underneath furniture feet that could bleed or rust. They will wipe up overspray from hard surfaces to help you avoid slipping. They will be courteous, honest, and straightforward about charges. Zerorez technicians will only perform work that you request, and there will never be “surprise” charges on your bill. Some spotting such as pet urine or red wine may require additional time and treatment, please discuss these issues with your Zerorez call center representative when scheduling your appointment. The Zerorez trucks are designed to ensure maximum power and effectiveness. Our larger trucks carry 450 gallons of alkaline water cleaning solution, which will last throughout the day. All supplies are on board the vehicle, and the technician is prepared to clean carpet, tile and grout, hard surfaces such as travertine or marble flooring, upholstery, and a host of other surfaces. 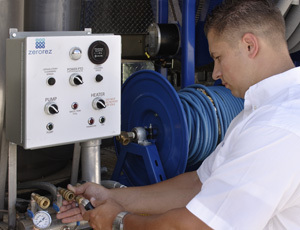 Our heavy-duty stretch vans are equipped with an onboard alkaline water generator rather than carrying cleaning solution from the base, but the process, alkalinity of the cleaning solution, and ability to clean many different surfaces is the same. The cleaning water solution is heated to about 200 degrees, so surfaces are cleaned and sanitized. Both types of trucks have an effluent tank so dirt, moisture, contaminants, and most importantly, left-over soap from other cleaners will be extracted and carried back to our base each night where the effluent is filtered and disposed of. There are systems that are less costly to acquire, but we feel that our equipment is the most effective and environmentally sound in the industry, which is simply the right way to clean!